Advent is a season of anticipation and repentance which focuses on the First and Second Comings of Christ. The dual focus means that Advent both begins and ends the Christian Year (Isa. 9.1-7, 11.1-16; Mark 1.1-8). Advent anticipates the First and Second Comings of our Lord. God’s prophets foretold his Coming, and angels announced his birth to Mary and the shepherds. We affirm God’s promise fulfilled in the arrival of Messiah in Bethlehem. Anticipation: 1st Week – The Advent wreath reminds us of God’s eternal love, without a beginning, without an end. The Candles reminds us of Christ’s light coming into the world. We light the first candle looking forward to the coming of the Messiah, Emmanuel, God-with-us. Annunciation: 2nd Week – We light the second candle to announce the birth of the Savior King, as the angel Gabriel announced to Mary, and the angels announced to the shepherds. Affirmation: 3rd Week – We light the third candle recognizing the fulfillment of God’s promise of our salvation. Arrival: 4th Week – We light the fourth candle in celebration of the arrival of the baby, born in a stable at Bethlehem, whose name is Wonderful, Counselor, the Mighty God, the Everlasting Father, the Prince of Peace. Come Thou Long Expected Jesus! "Come Thou Long Expected Jesus!" Come, thou long expected Jesus, Born to set Thy people free. From our fears and sins release us; Let us find our rest in Thee. Dear Desire of ev’ry nation, Joy of ev’ry longing heart. Born Thy people to deliver, Born a Child and yet a King. Born to reign in us forever, Now Thy gracious kingdom bring. By Thine all-sufficient merit, Raise us to Thy glorious throne. Advent season is the start of the church year calendar. By observing the church year we remind ourselves that we do not belong to this world but operate in the earth as a peculiar people whose citizenship is in the New Jerusalem. The word Advent means “coming” or “arrival” and the season has a dual focus of remembering the first coming of Christ and looking forward to his second coming. Theologically speaking, the season of Advent signifies a time of both preparation and hope. Therefore, preaching during Advent has traditionally emphasized both repentance and joy. Like other seasons in the Church Year, at Advent we use colors to remind us of theological truths. The primary color of Advent is purple (the color of royalty) which is used to remind us that we are awaiting the coming of a king. The secondary color of Advent is green (the color of life) used to remind us that God is sending the One who will make all things new. 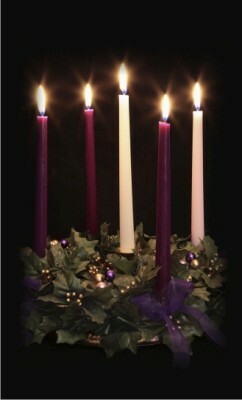 The Advent candles consist of five candles: three purple, one pink, and one white candle. The purple candles (lit on the Sundays of week one, two, and four) remind us that we are awaiting royalty, and the sole pink candle (which is lit on the third week), affirms God’s intent to eliminate all fear and restore creation through the coming Messiah. The final white center candle (called the Christ Candle), is lit on Christmas Day, and calls us to rejoice in the incarnation of the Son of God into the world. The greenery around the candle reminds us that we are proclaiming the promise of new life that Messiah brings. The flames of the candles remind us that Jesus is the light of the world who shines in the darkness and that the darkness cannot overcome the light. By lighting one new candle each week we remind ourselves that God is doing something in the world and that more is yet to come. The first candle is the Anticipation candle which remembers the prophecies made about the Messiah who was to come. The second candle is the Annunciation (i.e. announcement) candle which remembers the announcement made by Gabriel to Mary and by the angels to the shepherds. The third candle is the Affirmation candle which recognizes that by sending the Messiah, God has affirmed and fulfilled the promises that he made to humanity. The fourth candle is the Arrival candle which celebrates the birth of Christ.